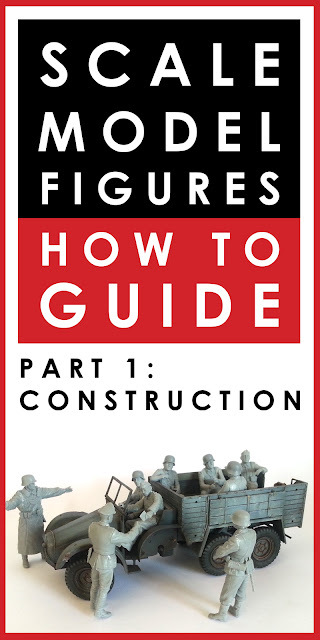 In this new multi-part video series I will show you how to build and paint scale model figurines, mostly concentrating on 1/35 military miniatures. The series is mostly aimed at beginners, but I hope there is something of value to more experienced model makers as well. In this first part I go step by step through construction: what tools, you'll need, how to clean flash from the mouldings, how to get limbs attached as cleanly as possible, and how to fill the inevitable gaps when they sometimes don't come together as nicely as you'd like. I'm doing a group of 1/35 German figures at the moment, as part of my ongoing Krupp Protze diorama, and I figured it was a good chance to cover off some basics and really get deep into the detail of model figurines. I know a lot of modellers struggle with figures - they can produce absolutely stunning armour or aircraft, but when it comes tome to prop the machines with people around them for a sense of scale it can be a bit daunting for some. Like most things in life, it all comes down to practice (as I regularly tell my 6 year old daughter) but there are a couple of hints to take on board and some traps to avoid which do make it a lot easier, and more of a pleasure, to build and paint model figures.